Miami Beach is home to a collection of unique and unusual lifeguard stands, including this artdeco-inspired one near 10th Street, featuring a futuristic round design and eye-popping bright colors! 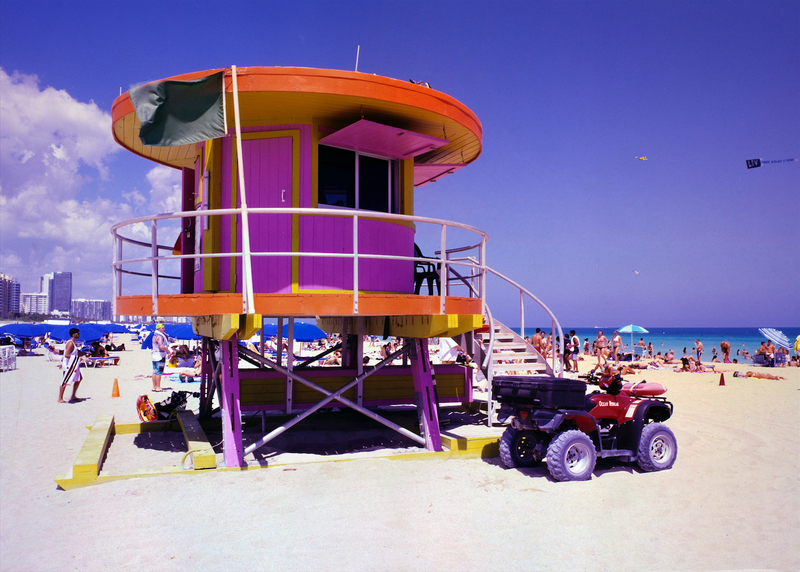 I made this photograph in honor of Expired Film Day on March 15, 2016- the middle of Spring Break- Miami Beach, Florida, USA with a 1977 Mamiya 645 1000s medium format camera/70mm Sekor C lens/CDS Meter Prism Viewfinder, on Kodak E100S Ektachrome slide film… purchased from @Ultrafineonline Photo Warehouse, expired in the late 1990’s, and cold stored. Shot at box speed- 100ASA, f/11 1/500. Processed E-6 by @DaleLabs. Digitized with a Canon EOS 5D MK II/Tamron 90mm f/2.8 Di SP 1:1 macro mounted on a @MeFototripods RoadTrip, f/25 ISO 100 4s, Gepe LED photographic light table, four shots auto stitched in PS 4 on a Mac. The colors in this image are those captured by this film, and were not edited. Some dust and Newton rings were digitally removed.